An English provincial rarity, the 3½in (9cm) tall, c.1688 Norwich beaker below was a target for collectors at Henry Adams (20% buyer’s premium) of Chichester. This c.1688 Norwich beaker sold for £3000 at Henry Adams on October 10. Although Norwich was once England’s second-richest city, its fortunes were declining by 1705 when its assay office closed as other cities were about to experience the great expansion of the Georgian silver market. Only a handful of pieces of secular hollowware survive. 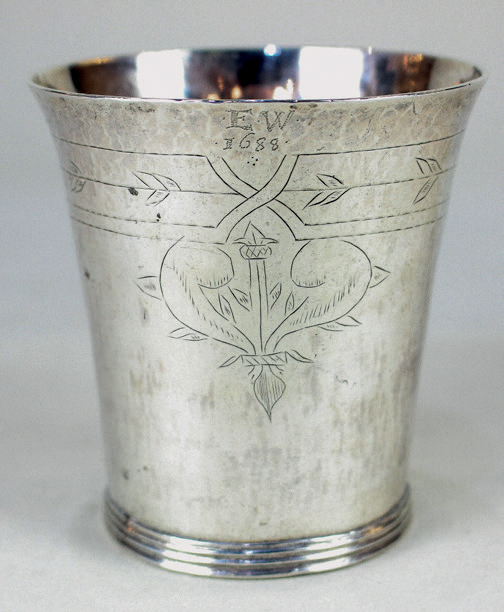 The beaker, with rather naively engraved leaves and strapwork was prick-engraved with contemporary initials EW and the date 1688. The maker’s mark could not be traced but, against a £500-600 estimate, the beaker sold to the UK trade at £3000 at the October 10 sale.